Portuguese palaeontologist Octávio Mateus has discovered the first dinosaur footprints in Angola, during an international expedition to the country this summer. 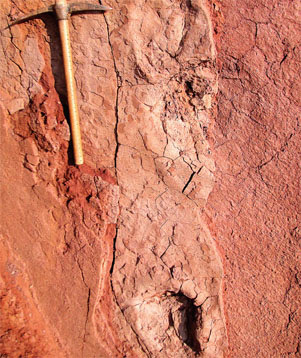 The palaeontologist told Lusa News Agency: “these are the first footprints ever found in Angola,” which are believed to have belonged to a sauropod that lived during the lower Cretaceous period, around 128 million years ago. The discovery is composed of 70 mammal footprints and dinosaur track ways, one of which shows details of the skin. During the expedition, sauropod dinosaur fossils were also discovered for the first time in the province of Namibe, in Southern Angola, “which provides new clues for the discovery of new resting places,” in that area. Fossils of plesiosaurs, pterosaurs and mosasaurs, marine mammals, whales and crocodiles were also found. Two new species of mosasaurs (marine reptiles), which were not known to have existed in Angola, were also discovered: Carnodeus belgicus, and Mosasaurus hoffmani, which had a skull measuring 1.5 metres. The expedition took place in the Angolan provinces of Cabinda, Bengo, Kwanza Sul, Benguela, Namibe, Huila and Lunda Sul. After being studied, the finds will be exhibited at the Geology museum of the Agostinho Neto University in Luanda. During ongoing expeditions in Angola, Octávio Mateus found the first dinosaur fossils in the country in 2005, which were classed as a new species of sauropod named Angolatitan adamastor.